The Internet has overwhelmed us with a lot of trends on social media; animated GIFs being one of them. Many a times, you may come across short videos that you may wish to share as GIF, on platforms such as WhatsApp or Telegram. The advantage of the GIF over a regular video file, is that it plays inline within the conversation screen, while videos usually play in a separate window. In this article, we’ve put together a few decent iOS and Android apps that help you convert short, usually 10 – 30 second videos, into GIFs and share them on social media & messaging platforms. ImgPlay allows you to create animated GIFs from Live Photos, Burst Photos, multiple photos and videos. Once you import the particular file(s) for editing, you can crop the frame, trim the duration of the GIF, add text captions, control playback speed, reverse playback and much more. After your editing has been finalized, it’s now time to export your creation as a GIF or video or directly share it on social media via the Share menu. You’ll get an option to select the output as GIF or video, and also control the output quality. You could save the output as a GIF in your Camera Roll, but in most cases, you’d likely share it directly on social messaging platforms like WhatsApp or Telegram. ImgPlay has a user friendly UI and you can create GIFs of any duration using the app for free. The only catch here is that the free version embeds a watermark at the bottom right corner of the videos & GIFs that you create using the app. But that should not be much of a distraction in our opinion. If you still want to remove the watermark, you can opt to purchase the Pro pack via in-app purchase, which costs $1.99. Alternatively, you could try using the below free app, which does not include any watermark. 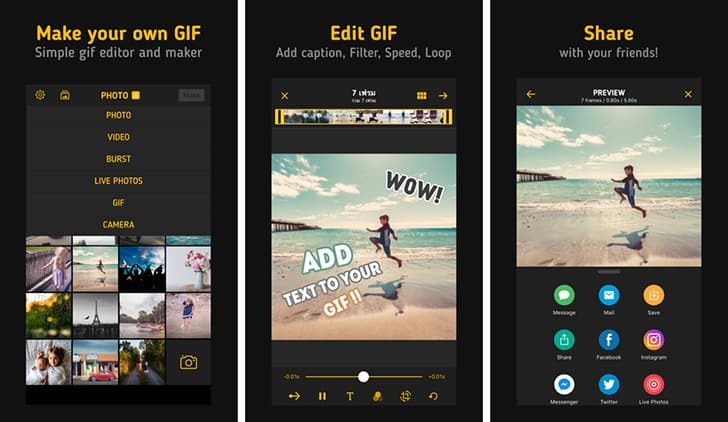 Gif Maker is a free app available for both iOS and Android, which enables you to create GIF from a set of photos or videos. You can also shoot a video within the app and create a GIF out of it. Later, the app allows you to set the playback speed, play in reverse, and add filters, text captions, etc. to enhance it. Finally, you can save the GIF to Camera Roll (iPhone, iPAd) or Downloads (Android), or upload the same to your preferred social network without saving it. The free version of the app lets you share up to 10 second long videos or GIF without any watermark. But the app is ad-supported, which could be pretty annoying considering the fact that video ads often interrupt your actions. But it’s a small tradeoff if you want to convert videos to GIF for free without any watermark. The 10 second limitation should not be much of a concern, as most of the popular GIFs are less than 10 seconds long. Gif Maker also has a paid, ad-free Pro version for iOS, which additionally increases the GIF duration limit to up to 20 seconds long. Gif Maker Pro can be purchased from the App Store for $3.99. The Android version of the app is free and ad-supported, without any limitations. Android users can additionally try another video to GIF converter app, known as Video to GIF, which is available as a free download on Google Play Store. Note: If you want to view your saved GIFs in Camera Roll, the Photos app is not sufficient, as it only displays GIFs as still images. To view animated GIFs in Camera Roll, refer to our dedicated article. If there is any other video to GIF converter app that you think are worth mentioning here, tell us about it in the comments below.